For every parent, nothing comes before the care and protection of their child. However, in today’s world, keeping kids healthy and safe is a greater challenge than it was years ago, and the list of threats keeps growing. Parents today are faced with the challenge of protecting their children from Abduction and Child trafficking, bullying and cyber-bullying, cyber and sexual predators, depression, identity theft, obesity, online malware and phishing attacks, school shootings and violence, and screen addiction. To deal with these threats, and to make parents lives easier to manage, a number of family locator GPS tracking devices have been introduced. We prepared this article to help parents better understand the difference between our products and others on the market. Most family locator GPS tracking devices look like kid-friendly wrist watches. For example, the iGPS Wizard Watch Phone is made from comfortable, but rugged molded silicone. It features a water-resistant and splash-proof touch-screen interface that can hold up to daily use. It also comes in five fun colors and includes colorful bands your child can use to personalize their device. 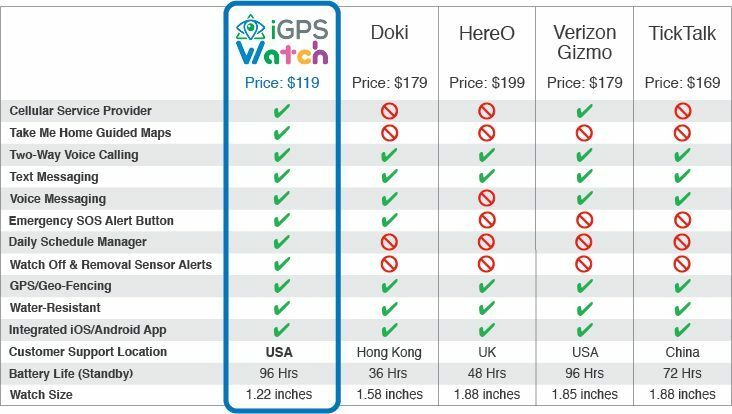 The chart below details the differences between the iGPS Wizard Watch Phone and other family locator GPS tracker devices from Doki, HereO, Verizon/Gizmo, and TickTalk. 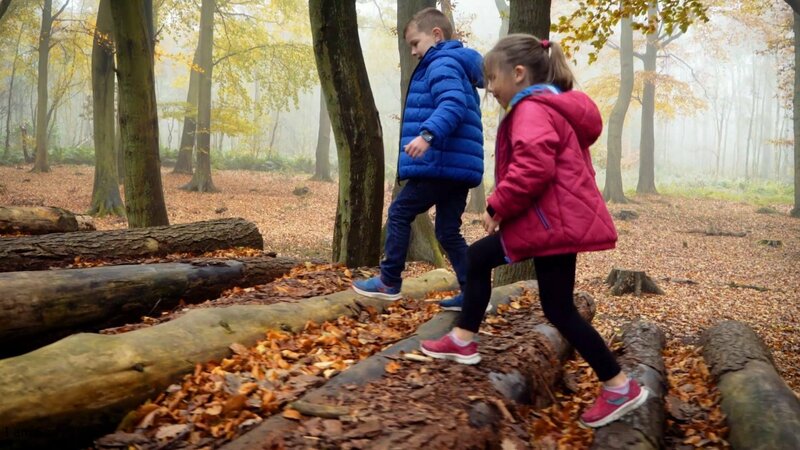 It’s clear that the iGPS Wizard Watch Phone is a full-featured GPS tracking device for children, especially in comparison to the top competitors.. It has all the features that help parents Contact, Locate, Monitor and Protect their children. But let’s look at some of its less obvious advantages. A key feature of the iGPS Wizard Watch Phone is that it offers parents a closed eco-system, giving your child a safe space. As the controller of the device, the parent can decide who can call and send messages to your child’s device, and who your child can call out to. This ensures that your child won’t receive scam and robocalls or calls from predators. The device is also not openly connected to the internet like a smartphone. The child cannot download or add distracting apps or games to the device. This effectively eliminates the risk of screen addiction, device distraction, social disconnection, and other problems associated with giving children an internet enabled device like a smartphone. Another important set of features for the iGPS Wizard Watch Phone that are often overlooked relate to your child’s daily routine. As parents, our lives are very busy. It’s difficult to manage your child’s daily routine. The iGPS Wizard Watch Phone solves this by allowing you to schedule daily activities in the iGPS App’s calendar. This will then alert your child when they need to be at a pick-up point, practice session or other activities. It’s also possible to review your child’s daily routines with the history playback feature. This allows parents to identify changes in their child’s daily routine. Some changes can indicate more serious issues, like depression, bullying, or associating with the wrong crowd. If you are still uncertain about the value of buying an iGPS Wizard Watch for your child, consider these final thoughts. The iGPS Wizard Watch Phone is the lowest priced model among the top competitors, yet, it is the only full-featured GPS tracking watch for kids. Our price is a full $50 less than the nearest priced competitor and we frequently offer discounts. If you are looking to buy more than one iGPS Wizard, you’ll be pleased to know that you will save an additional $20 on each additional watch you purchase. Your iGPS Wizard Watch comes ready to use. Before it’s shipped to you, our quality control team, based in Florida, will setup, test, and charge your device, so that when it arrives, all you have to do is download the app and connect your device. Another great reason to buy iGPS Wizard Watch Phone is that our support is based right here in the United States. Our teams operated from our Florida and California offices. Not matter what time zone you are in, you’ll have access to our support team Monday through Friday 9am to 8pm EST. Order the iGPS Wizard Watch Phone today! To order your child their very own iGPS Wizard Watch Phone, click the button below to visit our Buy Now page.